Australia have won their last 10 meetings with Wales. Neil Jenkins says Wales are planning to win their final World Cup Pool A match, no matter who wins Saturday's showdown between England and Australia. A victory for the Wallabies over the hosts would give Wales a place in the quarter finals. Warren Gatland's team face Australia on 10 October, and kicking coach Jenkins says they intend to win. 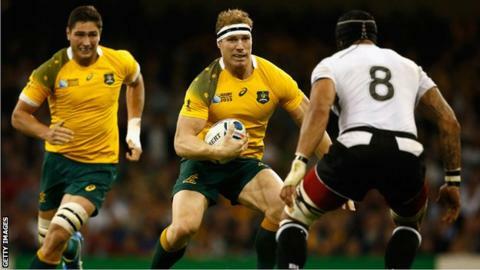 "The focus for us is firmly on a week Saturday against Australia whatever happens tomorrow," he said. "I'm not saying I'm rooting for the Aussies. "What will be, will be as far as I'm concerned, so whatever happens - whether England win or Australia win - we've got to see it one way. We've got to turn up a week Saturday and we've got to win, it's as simple as that." Wales, England and Australia can all still qualify for the quarter-finals but only the top two in the pool will go through. Jenkins was the first player to score 1,000 points in international rugby, and his Wales tally of 1,049 remains a national record. He said none of the Wales management team were going to watch the England v Australia game, and would himself be watching it at home. "Whatever happens - if England did lose tomorrow and they go out - we're still going to be looking forward to the game next week because it's an important game for us," he said. "It's a game that we want to win, we want to top the group and go through as group winners."